Steve has gone on retreat with the Emmaus Walk for the weekend. I miss him terribly. I’m still working on the clapotis, but unlucky for me, the two balls of yarn have become tangled – a mess. I’ve spent a lot of time trying to untangle the nastiness. Just as I was about to see the light of day, figuratively speaking, I ran upstairs to check on the boys, and Molly – our goat-beagle, got a hold of one of the yarn balls. She didn’t do much damage, but she did greatly increase the tanglement of the yarn. ARGH. Clapotis is on hold until I can untangle the yarn, and then I’ll need to wind the next two hanks into balls to use them. We took the boys to Lexington for a Family Retreat – meaning that we spent three days together – just the four of us – spending two nights in a hotel, playing with each other. We try to do this each spring break to have some time away from the real world. One benefit for me was a visit to The Stitch Niche in Lexington – a very nice yarn store. I came away with a pair of US11 Lantern Moon ebony needles. I have no idea what I will do with them, but I like them – they are beautiful. I also bought a ball of red – bright red – squiggle yarn from Crystal Palace. Here, again, I have no idea what I’ll do with it, but it was so RED. Squiggle and Lantern Moon ebony needles. La Claptosis is growing. I am now on repeat number five. I was being very careful to click my row counter after I completed each set of repeats in the straight sections until I realized (duh) that I only need to count the ladders of dropped stitches to know how many straight repeats I've done. I have found that this pattern almost counts itself. I am using stitch markers -- yes, I know that I can purl the dropped stitches instead of knitting them and avoid the counters, but I REALLY need these little plastic rings to say, "Here, dummy, ktb here, then k, then ktb." I also think that "reading my knitting" would be more difficult with this Shimmer yarn. It is MUCH thinner than worsted, even doubled, and it doesn't speak as loudly as worsted when you try to read it. I like my markers, even if they do slow me down, and I plan to keep them. They are very well trained in their job, which is to say, "Now NOW NOW. Stop just knitting and do something different!" 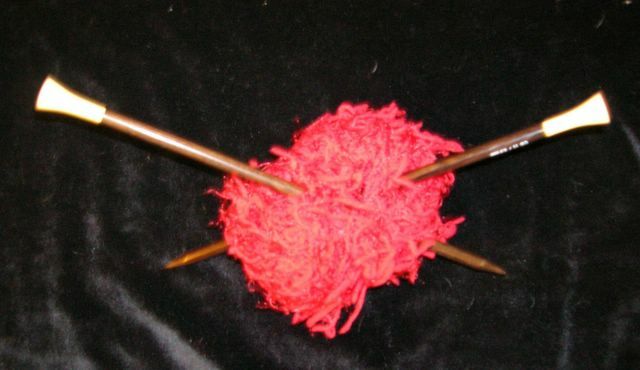 I read "Yarn Harlot" this morning, and have added it to my list of blogs to regularly read. Try this one; you'll like it! I must try to find her new book on Amazon. My next goal with the blog is to try to figure out how to add buttons to the sidebar. I would like to try to join the Knitter's Review blog ring, but I've got to figure this problem out first. We went to Lexington for a family retreat this past weekend. I'll write about that trip in my next entry. Our adventure did include (for me) a trip to a yarn store and a (yippee) purchase.